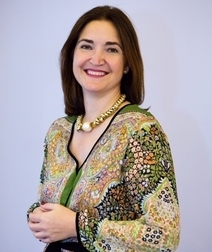 Cristina is part of the executive board of Women in Banking and Finance (WIBF), where she is Director of Memberships. WIBF is non-profit organisation for the promotion and advancement of women in the financial industry. The role is voluntary. In her professional career, Cristina is the EMEA Head of Institutional Sales as Santander Asset Management, the asset management arm of the largest bank in the Eurozone. Cristina has been at the Santander Group since 2007 when she initially joined the domestic broker Banesto Bolsa as Head of Trading & Sales Trading and member of the executive committee. After the full integration of Banesto into Santander, in 2013, she joined the financial institutions team and set up the multinationals coverage, initially in Spain and then in the UK when she relocated to London in early 2015. As Head of Multinationals for the FIG team at Santander Corporate & Investment Banking, she was in charge of the institutional relationships with international financial institutions in the UK: banks, insurers and asset managers. Prior to Santander, Cristina was a Senior Equity Trader at Merrill Lynch where she worked for 10 years. Cristina is also Vice Chair of the Board of Governors of Marymount International School and Member of the finance committee. She has two postgraduate degrees: an Executive MBA by the IE Business School and a master’s degree in Portfolio Management by the IEB, Spain.